Give your shandy a tropical spin with an intriguing combination of heat and pineapple. It's a fun twist on this popular summertime drink that is very easy to make. You'll love serving it at cookouts and it's ideal for those times when you want to dress up your beer. 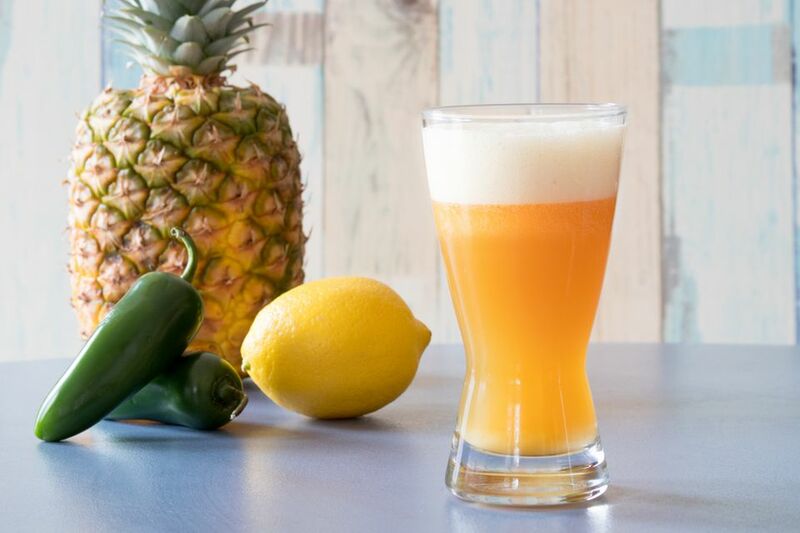 This shandy recipe starts out with tequila, spiced up with homemade jalapeño simple syrup and sweet, fresh pineapple juice. All you have to do is top it with your favorite beer. Pale ale works wonderfully with the fruit, but most lighter beers work just fine. It's not an overly spicy drink, either, but if you fear the heat just leave out the jalapeno. In a pint glass, combine the jalapeño syrup, tequila, and fruit juices. Stir well. Fill the glass with ice (if desired) and top with beer. If your beer and juices are cold, there's really no need to add ice unless you'd like to. Your drink will also stay colder if you pour it into a frosty glass. Pour the beer slower than normal and stop with a little extra room at the top. The foam head will form quickly as it interacts with the pineapple juice. You can always top it off once the head relaxes. Jalapeño simple syrup is very easy to make at home. You will need a raw sugar such as demerara, two peppers, and a cup of water. It takes just 20 minutes but will need to cool before you mix with it. Fresh lemon juice is best. The average lemon yields 1 3/4 ounces of juice, so one fruit is more than enough for a few shandies. You can even simply squeeze a lemon wedge directly into the drink. You can use a juicer to make fresh pineapple juice or muddle chunks of the fruit, then strain out the juice. If you buy the juice, consider using smaller cans so any leftovers don't go bad before you get a chance to drink it. A silver (blanco) tequila is an excellent choice for this shandy. Yet, it is really interesting with the slight oakiness found in a reposado tequila. For a milder spice that will also complement the pineapple, try a peppercorn syrup. Use either pink or black peppercorns—about 1/4 cup—and make it according to the cardamom simple syrup recipe. If you want to eliminate the spice entirely, a plain simple syrup will work just fine. Pour vodka instead of tequila if you prefer. Make this shandy by the pitcher to make serving a group quick and easy: Increase all of the ingredients in proportion for the number of servings you need. When making it ahead of time, hold the beer until you're ready to serve. You can also mix up the base (tequila, juices, and syrup) only then add the beer in the individual glasses. How Strong Is a Spicy Pineapple Shandy? Oddly enough, the alcohol content of the spicy pineapple shandy is going to be nearly identical to the beer you pour. That's due to the fact that the strength of the tequila is counteracted by the juice and syrup. For example, if you're using a 5 percent ABV beer, your shandy will weigh in right around there, too.